A name puzzle is a great way for a child to become familiar with their own name. 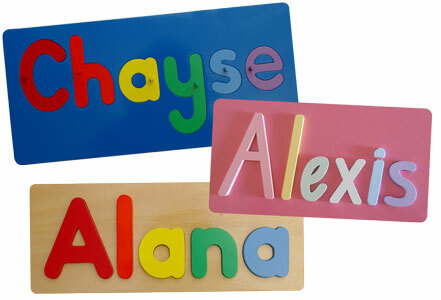 Name puzzles are available in a three letter styles - pegged, raised and script. For a small surcharge they can also be made in ALL CAPITAL LETTERS. See our name puzzle colour chart for the various colour options or choose your own colours to match your child's room from our colour swatches. Price is per letter and includes the baseboard. We offer a 10% discount for orders of 6 or more name puzzles (when ordered at the same time). The discount will be applied once order is received.